A disgusting, degenerate, insipid young folklorist from the Croat & Isaiah Nettles Foundation for Ethnological Research meandered mesmeric ally midst marble mansions in Mattapan, Massachusetts. It was an unsavory, vapid day in the summer of 2010 as the jejune air from Back Bay transubstantiated itself auto logically and gradually into an ozone-like atmosphere. Knocking on a random door, haphazardly, the tasteless young man pondered the Hebraic inscription on the marble-tiled foot-brush, soporifically: "I wonder what the hell that means," he said to himself reflexively. The foot-brush backed itself into a corner at bay, with its back to the wall. Then, hissing at the wishy-washy young man, it reared up on its hind leg & stared into space, vociferously & stolicly. At this juncture a somewhat equivocal shoe-shine man opened the door, munching on a vacant popsicle stick. Before greeting the young man he reached up with a tentacle and stroked the aging foot brush on its fore, thus quieting the beast's existential anxiety. "Pardon me," the unflavored young man said casually, "Do you have any old arms and legs you'd like to sell? I'm paying thirty-seven, twenty-five, ninety-six, twelve cents apiece for old arms & legs depending on the condition they're in." "Just one moment," the splotched ontology professor mumbled, "I think we may have a few out back in the quagmire, or possibly near the fen, or then again we may have some by the waters of the boggy bayou. I must point out, however, that it is quite possible that we have none left. And I should also say that we may never have had any anyway. I certainly can't remember ever having any. Since the past went into a flux it's very difficult to remember anything, you know. But I'll certainly take a look. And don't be afraid of my foot-brush. He’s been in the family for years. And, while it is quite true to say that he hisses a lot, and he certainly does, it is also quite true to say that he never bites anyone except when he does. But this is not the same as to say that he has actually bitten people, and I certainly wouldn't go so far as to say that, because, well, for one thing I can't remember anyway. But I'' go look for those arms & legs like I said I would. Did I say I would?" "Yes, you did," the stale young man replied weakly. "Well, then I will, in all probability," the aging grave-digger muttered as he faded gradually through the irregular portal. "Why, thank you," the insipid young man replied discordantly as he sat down on the jeweled obelisk. The degenerate young man considered his present state ponderously. "I wonder," he said quietly now to himself autologically, as the immense live-oak leaves scratched forebodingly against one another and scraped against the sides of the hovel in which the aging football-player lived, occasionally, "I wonder if I'll ever be able to get a better summer job. Perhaps some day if I can find the right size & shape ---," he went on autochthonically, "---I'll get a raise." At this point the grasping shoe-shine man re-entered the front gallery of the mansion and kicking the foot-brush into the obtuse corners, mid hisses & groans, spoke and said: "here's a few you might look at. I found them out back in the fjord. They're not in very good shape, but then they're pretty old." "Just the kind I'm looking for," the young man replied repugnantly as he inspected them randomly. "Yes, very good," he went on languidly. "I'll give you $5.00 for the lot, if that's alright?" "Yes, that'll be fine," the acrobat replied. "Do you mind if I ask you what you're going to do with all those old arms & legs?" "Gonna make new ones out of 'em," the young man replied degenerately, "Those, that is, that I can't eat." "Oh, I see," replied the enema man. "Anything else you can use?" he went on judiciously. "How 'bout an old radio. It don't work now but it used to play real well. I also have a whole gang of old bulrushes and cattails, and not only that, but I also have an old wind-up toilet. Could you use any of them?" "No," the young man replied, "I'm sorry. You see, I'm working my way through college - as a road man for the Arabian-American Antique Company, and all I've been authorized to deal with is old arms and legs. Occasionally hands & fingers separately it they're real good ones. There is one thing, though," he went on extensively, as he handed the turnip salesman a crisp, new five dollar bill. "I can use a little information if you've got any of them. How long have you lived in Boston?" he asked randomly. "Oh, 'bout forty years, give or take fifty," the gas man replied, "Why?" "Well, think back a few years, did you ever go to any of the clubs around Boston during the 1960's and perchance see or hear of a guitar player named John Fahey? I need any information I can get on him for my Master's thesis. I'm doing it on pre-second foundation artistically creative geniuses." "well," mumbled the electrical gymnast, "that's been a mighty long time, you know. But come to think of it, he left such an undying vivid impression in my mind that I do remember him a little. I think I saw him a few times. You know, they say he got eaten alive one night by a wild, man-eating GETCheLL that escaped from the zoo. Aside from that, all that I can remember is that his true meaning seemed to reside in the fact of his autological reality, i.e. : his existence, or perhaps in his epistemological fixity. For he existed just as, yea verily, you and I do, or at least that much anyway: he existed as no character of the imagination could exist. His great weight, mystery, and dignity were in this fact....."
"That's very interesting," the young man spoke quietly now, as the unwary cypress groves wended their way down the hill, towards the setting sun. "And, I never heard that about the Getchell before." "Oh, it's true," continued the aged bee-keeper. "I'm sure any of the old-timers around here can tell you the same thing. There was a big to-do about it in the papers. I remember that. I have a very good memory you know. But I don't remember much else about him because nothing else caught my attention at the time. And besides it was so long ago. So dry long." "Yes, I can certainly understand that," the young man stated flatly, but not too boldly. "Could you direct me to anyone else who might remember him?" the young man asked insipidly. Down in the North End. I'll bet he could tell you something. But it is getting late. You and I are getting old and we are going to die someday," the retired prelate went on. "Yes, and we are growing old with whoars," the insipid young man replied diagnostically. "Yes, I have seen Fahey," said Riverboat. The insipid young man observed with distaste the moans and shudders racking his aged frame. Wonderment superseded distaste as the old man continued, after a time, "I have seen many Faheys, and also the place from which Blind Joe Death made his bodily ascension and was transfigured. And also son," and once again he sank into the deepest distress, "I have seen John Fahey." The young man feared that something like this would happen. At the desk he had been told that Riverboat's lucid periods were becoming rarer and rarer, that reality receded ever further from his grasp. And yet the young man realized that his entire future at Nettles depended on what he could find out from the aging schizophrenic as to the fading legend of the elusive John Fahey. "Oh God! I searched and searched everywhere, but they were all stooges. There were surrogate Faheys, bogus Deaths. Denson's zombies were everywhere, the poor devils ---the poor devils ---." His voice trailed off, and he became lost in distant reflection. The young man pondered for a time on all of this, and on the possible grain of truth in these demented ravings. All he knew was that Fahey (& Death) had recorded for Ed Denson's Takoma label in the early 1960's, for all this was in the standard discographies in the reserve stacks at the Bogus Blind Ben Covington Memorial Library at Nettles. In addition, Fahey was known to have lived at this time in greater Los Angeles, and thus had presumably perished in the great cataclysm, along with the rest of coastal Southern California. Not much, for a Master's Thesis, but even the flimsiest straw had to be clutched now. "Tell me, Mr. Riverboat, about the--Faheys--you have known. How many did you---say---?" "I came to know many Faheys during the time I spent with the EVIL DENSONS OF The UNDERWORLD. Yes, as I said, I even saw John Fahey a few times, though it was more than I could bear." Again his frame began to shudder, but he continued on, "But the one Fahey, I knew well, and the only one on the outside, was the one I recorded in Boston. Of course, I thought at the time I was recording John Fahey, but I became suspicious when I read in Variety that on the very eve of the recording John Fahey was playing a benefit at Boys' Town in Missouri. I decided to ask 'Fahey' about this when I arrived home (for 'Fahey' was staying there while working the local coffee houses.) But upon my arrival I was greeted with a horrible scatological sight:'Fahey' was slumped in a chair, transfixed with terror, shaking visibly from head to foot, and staring fixedly at an envelope, and waves of terror began to flood through me-as I examined it, for it was addressed to Chester C. Petranick c/o---me! ; the return address read: Harmonica Ed, Box 2233, Berkeley, California. As I shook the envelope, so as to remove the enclosed letter I discovered that there was no letter, for instead, in my outstretched palm, I observed a little mound of------grist!" "I looked down with increasing alarm, for 'Fahey' was now staring at me, with wild, imploring eyes." "Fearfully I asked him, "What does this mean"' and fearfully he replied, "It is death.'" Silence filled the room, and again Riverboat's mind began to wander. The young scholar sat transfixed for many moments considering the words of the reminiscing madman, and then spoke. "Chester C. Petranick wrote the notes for Fahey's 'Death Chants,' and also an album with Blind Joe Death." His voice was lowered in reverence, and in confusion. "Are you saying that this person at your home was the same Petranick?" But there was no response, for Riverboat was suddenly staring at a bottle which the young man had brought with him. "What is that, son?" he asked. He seemed to be in a state of considerable agitation. But there were to be no more answers from Ralph Riverboat. Paranoia engulfed him in tortured waves, and as he glared at the insipid young man, he began to rant and rave about "Denson's afterbirth empire," the FEMALE GETCheLL, LINDA," "EVIL DEVIL WOMAN," "ALLIGATOR MAN," and "BILL BARTH, KEEPER of the Fahey." And then he turned on the insipid young man, screaming "GETCheLL lover," again and again as he tore the room to shreds in his fury. As the attendants poured through the entrance he smashed the jar of afterbirth in impotent rage. Shouting, "John Fahey, John Fahey, John Fahey," and "Beware, Beware of Denson and his Getchell who may yet conquer the world." But the young man was now gone. He was running down the hall, flushed by waves of resolution the like of which he had seldom known, for he now had a lead on John Fahey. And yet----could it be? Could the Ed Denson of Takoma, in those far-off days be the same as the Ed Denson, the aging, eccentric tycoon who had revolutionalized the American pet scene with his lovable, tamed Getchell and his patented, homogenized 'She-Wolf' brand afterbirth? "Yes, it is so," said Denson, as he casually picked a pair of fleas from his beard and fed them to one of the GETCheLL. "I do have information which might prove useful to you for your John Fahey thesis. You will, of course, understand that I am a busy man, with but limited time to devote to many projects. Nonetheless John Fahey is a subject dear to my heart, and I feel I can devote an hour or two to the topic. You see, Fahey is to be the aesthetic standard of the new order." The cringing youth was euphoric for he had scarcely dared to hope that an insignificant, degenerate cipher such as himself could ever actually talk with Ed Denson, whom presidents dared not offend. It was, in fact, a very curious business. They had been throwing him out of DENSON INTERGALACTIC headquarters in the bustling seaport town of San Bernardino when an old man of eighty-six heard him sputtering about John Fahey. he was a dark-skinned janitor from India named N.S. DHUSTY, an incredible figure who identified himself, auto-chthonic ally, reflexively, and autologically as John Fahey's Veena teacher, somewhat relatively. It was he, who had henceforth brought the youth to DENSON's INNER SANCTUM under the desolate scorched wasteland of the Mojave desert. The insipid young man wondered at all this, and was awestruck by the eerie series of compartments which comprised DENSON's catacombs. he was now two levels beneath the ground. Soon, however he was on the third level, where he encountered an ungodly din. For, as he looked on in amazement, fifty-odd white-haired guitarists of varying abilities were struggling with The DOWNFALL of the ADELPHI ROLLING GRISTMILL, and all at once. After a seemingly interminable period, the cacophony lurched to a halt as a lone instructor bellowed out directions concerning right-hand technique. Once again the group went into action, lumbering clumsily through the selection. "I am very concerned with this group's progress, or rather the lack of it," said Denson. "Even hypno-training is not producing any noticeable results----I fear the worst. We'll have to brainwash them, start from scratch----but the inconvenience, not to mention the delay, seriously impairs the entire project." "Come in here and I'll show you," said Denson, leading the baffled youth into the next room. "See these (at this point throwing a pile of Billboards, Cashboxes, and Varieties into the youth's cap)----they're all saying the same thing. Folk Music, and Folk related Music is coming in again, and it's going to be big - I mean really big, much bigger than the 60's." he was suddenly engulfed in a wave of excitement as he said, "It'll be just like old times----I'll have a Fahey in every city, town or hamlet which has a coffee house. But that is only the beginning." he was now speaking rapidly, with a feverish glint in his eyes. "Supermarkets! That's where the real money is to be made! I'll have FaheyS playing for the little woman in shopping emporiums throughout the inhabited universe. It's always been my grandest scheme, save for one." he was now indulging in a smile of pride and of surpassing wisdom. "I will call it the INTERGALACTIC Fahey SUPPLY," he said, "What do you think of it?" The insipid young man hesitated for a long moment, and then surprised even himself. "Pardon me for asking you, Mr. Denson, and don't consider me impolite or ungrateful, but what makes you think that the housewives of our universe want to listen to John Fahey?" It should be borne in mind that the feeble youth seldom spoke or enquired so decisively. But Denson didn't seem to mind. "Son, to come up in this world you needs a proper understanding of power, and its legitimate use toward profitable ends." He was again pulling at crawling things in his beard, which seemed to the young man to be unaccountably mangy for a man of his stature. "In this instance, one must not forget the utility of my AFTERBIRTH EMPIRE, for it is true that the good housewives may at first find Fahey's music unsettling as they wend their way through the aisles. But, you see, the housewives have little choice in the matter, for I shall make the wholesale shipments of my homogenized afterbirth contingent on the installation of a Fahey in each and every chain store. The owners of the supermarket chains, you will appreciate, will be in a quite difficult position, for the lovable beasts will eat nothing else, save for people. Nearly all families have at least one GETCheLL now, and would be forced to take their business elsewhere. This would of course, be intolerable for the supermarket owners in question, and thus we have the INTERGALACTIC Fahey SUPPLY. I shall make millions. But come along now for there is much more to show you." At this point Denson led the young man down a further flight of stairs, to the fourth level. "This is the basement," said Denson. "Perhaps you might find further conversation with our janitor, DHUSTY, illuminating. After all, he was in Boston with----oh, which one was it now, for it was an unsettling business." he now halted, for the mysterious old Indian had appeared, and was brushing grime and dust from his turban. As he spotted Denson he fell to his knees in a gesture of obeisance. "No, but that's all right, for this young man that you brought here seems interested in that record Chester cut in Boston, and perhaps you could tell him about it, for I shall be busy a brief time. I'll be back soon, however." As the wealthy eccentric receded from view the cowardly young student was lost in thought. It was slowly dawning on him that most of RIVERBOAT'S "mad ravings" were being confirmed as stark realities. In fact, it even crossed his mind that Ed Denson was not necessarily very concerned with his personal welfare and happenings. But before he could deal with these musings in a systematic manner (for the young man was very systematic) he was interrupted by the aging janitor, who was reminiscing about the Boston period, and who appeared to be very agitated by his recollections. "I begged him not to do it," he said, and tears streamed from his eyes, "But poor Chester was so miserable, for he hated being a mere functionary, a straw-man. He couldn't realize that he was a necessary and valued contributor to an undertaking greater than himself. So often Massa would come around to the quarters and tell us how he loved us all and that 'we were everything and he but nothing!' 'Nothing' he said, and he such a great man." DHUSTY paused, wiping the tears from his face, and then continued, "You see, he recorded tapes for a Fahey album for RALPH RIVERBOAT without Massa's permission. True, it was The Fahey, note for note (there never was a better Fahey interpreter than Chester) but Denson hadn't OK'd it. And despite the bond of friendship between us I had to tell Massa, and----Chester paid dearly, for the crime was unforgivable. The tapes were subsequently recovered, some of which appeared on the Tacoma album "The Great San Bernardino Birthday-party" along with several items by the real Fahey, but it was a close call." "But what happened to RALPH RIVERBOAT?" "DHUSTY brought him here, for he sought information on John Fahey much like yourself." It was Ed Denson talking, he had just returned. "I did not disappoint him, and likewise you shall not be disappointed. Come-along, son, for there is yet much for you to see." It was dark and damp in DENSON's UNDERGROUND. DHUSTY led the way, through the winding passages with a lone candle, which was flickering mesmerically, casting faint flashes of pale yellow on the surrounding walls of rock. It was completely, utterly silent. And then----. A "room" the size of a house. In the middle of this huge clearing was an underground brook, spanned by a wooden footbridge, whose gurgling and babbling seemed strangely amplified and distorted as it echoed through the cavern. And to the left, just off the path, was a curious mound about two feet high. DHUSTY and Denson were now gazing at it, and tears had come to their eyes. DHUSTY had fallen on his knees again, and appeared to be praying. "What is it?" implored the youth. "It is grist," replied Denson. He was now running it through his hands, watching it as it drifted irresolutely through the dank, heavy air. "This, my son, is the GRAVE of BLIND JOE DEATH. And it was here, on February 5, 1962, that I witnessed his bodily ascension and transfiguration. Thus was introduced the new age, for which DEATH is to be the religious standard." "Oh, Massa!" exclaimed DHUSTY, who was radiating joy, light and peace to all beings. "Surely DEATH was an incarnation of the supreme Brahmin, that which has no form of love and compassion between sentient creatures." "Yes, DHUSTY, it is as you say, and it is my fondest wish, that I might bring the message to all the world." As Denson spoke his voice became charged with the heady recklessness, fixity of purpose, and quiet desperation of the fanatic. In his eyes was the fixed gleam of insanity, as he clutched his harmonica to his bosom. At this time the cringing student again became fearful about his personal safety. He knew about these odd types. One had to be careful. Unfortunately, before he could formulate a definite plan of action, Denson was talking to him again. "Come along, son, we are approaching DENSON's UNDERWORLD, the last stop of your little tour. And the three crossed the bridge, coming upon a large door of graven cypress hitherto lost in shadow, which Denson promptly opened, calling out: "Barth, come hither." And at length a strange figure appeared in the entrance. He seemed ancient and withered, his hunched frame clothed in a tattered old robe across which dashed the ram, the bull, the scorpion, and all the other figures of the zodiac. "What do you want, boss?" "Barth, I want you to show this young man around the UNDERWORLD, and tell him anything he wants to know. He knows quite a bit already---deal with him accordingly." And Denson and DHUSTY were suddenly gone. "Come with me, young man," the ancient rabbinical figure commanded in a resolute and confident tone, "for I have much to show you," he went on, as he led the insipid youth through yet another winding corridor. But this was only a short one, for in but a few minutes they had emerged into yet another "room", smaller than the last, but definitely more terrifying. In the center a fire blazed, casting strange, fleeting images on the walls of rock and ice. And built into the far wall was a row of cages! For here lived---the EVIL DENSONS of the UNDERWORLD!! "Let me show you my pretty little pets," he went on, his voice now rising to meet the occasion into an elated tone. As they approached the first cage which contained a white-haired, wolf-like, apparently female but somewhat indeterminate withered-up, skinny old humanoid, they were greeted by agonized shrieks and gnarls. "This," said Barth, as he jabbed the beast with the sharpened end of his staff, "this is my lovely pet She WOLF. Isn't her hair lovely?" he chuckled evilly to himself. "And in this cage," he went on, eyes burning now with pride as he pointed to the ajar- cent cage, is her mate, EVIL DEVIL WOMAN." Again they were greeted by an evil snarl from the somewhat darker haired and plumper creature. "But my dear young man," he went on, "before I can tell you their story, I must show you She-WOLF's ALTERNATE MATE: GOS-HAWK MAN, for it was he who invented Ed's most popular product: She-WOLF BRAND AFTERBIRTH!" And there in the third cage was another creature, more hairy and dark than the rest, somewhat small, and sitting on its haunches in the corner munching on a Eucalyptus tree leaf. "Many years ago," the hebraic patriarch went on, "GOS-HAWK MAN (when he was out in the world somewhere) gave shelter one night to a strange visitor to the city in which he then resided. It was none other than She-WOLF, great with child, and with no place to lay her weary fangs. That night, somewhat parthenogenically, she bore a child which had wings and which flew away shortly afterwards never to be heard of again. GOS-HAWK MAN, easily duped into submission by the EVIL CHTHONIC FORCES of the UNDERWORLD, helped deliver the child or whatever it was, and conceived that night an idea which was to have intergalactic repercussions. For GOS-HAWK MAN had residing with him a pet kitten, and being broke and destitute at the time he had no food to feed the poor creature. In the morning while She-WOLF was sleeping, exhausted from her labor, and nursing her child or whatever it was, on her middle breast, GOS-HAWK MAN crept up to her pallet and gathered together the afterbirth in his grubby little claws and hid it in the refrigerator. Later he attempted to feed it to his cat and found that the cat would eat it and thrive on it, but unfortunately didn't apparently, like the flavor very much. He kept a small portion in the refrigerator and whenever She-Wolf would go out to catch her prey he experimented on the substance in his secret laboratory, to try to find a way to make the substance more palatable to his cat. Eventually he found that by homogenizing it and adding certain spices and herbs, his cat relished the substance. He then set about to synthesize the substance for he planned manufacture it as a commercial cat food. But one night Ed, who had the place wired and who had been watching through a rear window for some time, broke in with his storm troopers, spirited GOS-HAWK MAN and She-WOLF away and stole the magic formula which GOS-HAWK MAN had finally created. And that, young man is the story of the invention of the afterbirth which volts all over the world, and perhaps you yourself, feed to their pet GET hell." "Amazing," the young man gasped, "I had no idea that..."
Of course we have the whole area wired and televised so that as soon as she bears one we steal it away from her and bring it here. She lives alone because she can get along neither with her own kind (for they have all long since been domesticated--but she always refused even the slightest concessions in this direction) nor with human beings (for these she has an uncontrollable desire to tear apart with her sharp claws--a desire which she promptly carries out whenever she runs across any people in her mountains.)" "And that, of course," continued Barth, "brings us to the topic in which you are primarily interested, i.e. : namely Fahey." "Yes, Fahey," the young man replied. "Do go on." and eagerly. "But wait--let me calm down a moment. I'm starting to hallucinate again." he then proceeded to sit down among several of the hot coals which had fallen from the fire. "Ah, he subsequently went on, "Fire always soothes my nerves and eases my care. Yes, now I feel much better, and I shall tell you all." "Ed came to me one night and told me that he would pay me to deliver Fahey to him alive, but subdued. It was essential that Fahey be subdued, of course, for he always carried with him his MAGIC SAMURAI SWORD ZEN BONG GONG, and he knew how to use it quite effectively, as I well knew. And Ed reasoned that even though I could never overpower him in actual combat, I might think up some way to subdue him since Ed had heard that I was very crafty and possessed magical powers of paranoia-induction, and renohyperbobulastumistic haruspicy. Also, at this time, (And Ed knew it) I was Fahey's best friend, or so Fahey thought. And Ed was quite right. It took me very little time to make my bread." "You see Fahey used to like to go to the Boston Zoo every afternoon before he went to work and while away his time-with the female Getchell they had there, Linda. He liked to just sit there on the bench and gaze. he'd feed her peanuts and he'd try to talk to her but she could never understand what he was trying to tell her because she was only recently imported from the wild steaming jungles of the planet Dorchester, in the 93'rd Sector of the Carpathian Galaxy. Sometimes he'd bring his guitar and play some of his songs for her. She seemed to like music, especially waltzes, and his stupid music somehow communicated something to her, and sometimes she would become very quiet and still, and she would purr like a cat. That made Fahey very happy. You know, he even wrote a song about her, and I think the original recording of it got issued on the Boston period album. I don't think Chester's crude-imitation was issued for that cut. There was a banjo, played by, I think, Earl Scruggs or L. Maine Smith or somebody or other. He wrote that song about her one night while he was playing an exceptionally drunken set at the Odyssey Coffee House." "That was, I believe, the summer of '65 or '85 or '36 or something or other. I had been employed by Fahey for several years as his faithful Jewish manservant and Haruspex, but now I became a double agent and counterspy or what have you, just like on television. Fahey thought that he knew all about Getchell but, well, I knew a little more about them from my psychedelic trips to other heavenly bodies. I knew more than Fahey knew about a lot of things. Just imagine! He even thought he loved one, as dearly as one might love a dog or cat. What a fool he was. How could anyone love a Getchell? The very idea. They're so stupid, you know." "Well, one day while Fahey was at the zoo, he fell asleep, and while he couldn't tell what I was doing--and I also knew that Linda hadn't been f ED yet--I stealthily sneaked over to her cage and broke the lock on it and opened the door just a little and then I ran and scurried up a tree. It was both very terrible, and extremely homological. The GET hell sprang from the open door right on top of Fahey and proceeded to tear him apart. But I with my magic paranoia-inducing powers scarred her away just in the nick of time, before she had eaten Fahey." "Fahey was by this time unconscious and bleeding profusely, and I, BILL BARTH, spirited him away to Denson's secret catacombs where I was promptly paid 30 pieces of silver. And that, young man, that is how I delivered him into Ed's hands. No longer am I Fahey's faithful Jewish manservant, but rather, ---I am The KEEPER OF The Fahey." By this time Barth was once again by demoniac fits of laughter, as he raged and ranted somewhat sadistically. "And Fahey--" he went on giggling, "Fahey still waits in his cage, thinking that perhaps someday the female Getchell Linda will have a change of heart and come and rescue him from me - and Ed, and from the times when I periodically let Evil Devil Woman into his cage. She likes to eat people too, you know. But sometimes," he began to shriek,---"sometimes I even play the voice of the female Getchell Linda over the tape recorder while Fahey is sleeping, and he wakes, thinking she has finally come, haaaaaa, he, he, he, but she will never come." His last words had come forth like water from a hose as the pressure is turned up to its highest intensity. Finally he fell on the floor, convulsed by paroxysms of laughter, gnashing his teeth, and rolling in the grist which covered the floor. But the insipid young man was not thinking of Barth any more. Fahey alive? Not once in his journeys had he ever suspected it possible. "What about the cataclysm?" he asked, bewildered. When finally Barth had recovered, he stood up brushing the grist from his ancient rabbinical attire. "Ah yes," he went on, gradually returning to his normal level of insanity, "--the cataclysm of 1966. It was June 5 or May 7 or something or other. Anyway, Fahey was right here where he is now." -- and Barth pointed to a cage on the far side of the room. As the sniveling student approached the cage he was greeted by the most shattering scene he had ever observed, or even conceived of, for there was John Fahey, the legendary Volk-like hero, simpering and muttering in the corner of a cage, dressed in tattered rags and encrusted in grime. He was reclining on a mat of woven grist, which was the only thing in the cave save for a Martin D-45 guitar. The young man hesitated, benumbed with horror and bewilderments, and finally spoke: "John Fahey, I presume?" The aged Fahey turned with a start, and seemed for an instant to panic. But he quickly became confused, turning towards a wall and starring at it blankly. Finally he faced the young man, simpering and said, "All is ichthological in design, it not in intent." The young man was speechless with horror, for Fahey was completely and utterly mad! The demented guitarist became frightened, for the revolting youth was staring at him with fierce intensity. He retreated to the rear of his cage, whimpering. "John, do you hear me?" It was Barth, now at the cage, speaking softly and malevolently. Fahey looked up, now sobbing bitterly as Barth continued. "Now Ed's been real nice today and given you some nice grist and water to eat, hasn't he? We like Ed, don't we?" "Yes," simpered Fahey, "Ed is a nice man. I like Ed. Ed is my friend. I know that Ed is my friend. I know that. Yes." A sudden radiance had swept his features. "So now we're going to help him get out a new Fahey album, aren't we?" Barth was triumphantly wheeling portable recording equipment toward the cell. But Fahey had again become confused. He looked sternly at the mat of woven grist and began to talk, with oratorical gravity. "Beware, beware of the day of the ornamental ironworks. But while we were growing old with whoars, they took us all away, my good mat. And ever present is the danger of creeping calligraphy, the filthy swine, the mangy dogs, the degenerate whoars, the slimy bastards, the-----." "Fahey!" screamed Barth. Startled, Fahey turned to face his tormentor. "Now pay attention John, listen carefully." he paused for an instant, and a sadistic snicker flashed across his aged frame. "Getchell"---"Getchell"---Do you hear me Fahey?"---Getchell." The spineless young scholar was aghast, for Fahey's countenance was alternately crossed by terror and euphoria. "Now listen to this," Barth went on, as Fahey began running around his cage banging his head against the walls, and foaming at the mouth. "Evil"--"Evil Devil"--"Woman." --Now which would you like? "-"Getchell, Evil Devil"---And in the next cage, a Getchell was becoming feverish with bloodlust. It madly gnashed its teeth and clattered on the bars with bared claws. And in the cage next to that of the Getchell's was Evil Devil Woman, sitting quietly, patiently, but with a hungry expression on her face. "Would you like to visit John again tonight?" Barth was addressing the Getchell, who, though but a dumb beast, reacted with increased fervor. It was now growling fiercely and smashing the cage, attempting to free itself and get to Fahey. "or how about you my pretty little pet?" Barth inquired of the sultry Evil Devil Woman. "Which will it be John," Barth said turning to Fahey, "Blood or insanity?" "No, no, no," screamed Fahey, "I'll do what you want!" Barth looked at Fahey contemptuously and both were silent. But the Getchell was creating a fearful din, roaring and smashing its head against the steel bars. "Oh, won't you please shut up," whined Barth, addressing the Getchell. "Here," he said, opening a large jar of She-WOLF BRAND Homogenized AFTERBIRTH and thrusting it through the bars. Instantly the creature became still, save for gentle purring noises emanating from its throat. Then it sprang upon the jar and slurped up the afterbirth in a few quick gulps, whenceforth it became contented and serene, and quickly fell asleep. "You know," said Barth, "sometimes I feel that Getchell have more ordinary good sense about food than people. In fact, I still can't understand why the authorities were so sickened when the Boss's afterbirth hit the shelves. After all, it is rich in protein and other essential nutrients---their attitude was deplorably unscientific, all in all." "What caused them to relent?" "Well, it was all very simple, actually. People wanted Getchell, but unfortunately the Getchell also wanted people. --for food. This grisly circumstance prevented the wide spread domestication of the animal until GOS-HAWK MAN uh, donated the new formula to harmonica Ed. After all, despite the plentiful supply of arms & legs at that time, there were nowhere near enough limbs to support a really large amount of Getchell. Anyway, Ed's advertising combine swung into action and soon everybody thought they wanted a pet Getchell. (Subliminal hypnotic methods worked wonders in this regard.) Quite naturally they preferred afterbirth to being eaten alive, and thus we have DENSON'S AFTERBIRTH EMPIRE." Barth was now wheeling the recording equipment into Fahey's cell, and was setting up microphones. Fahey was chattering amiably about medieval theology with the mat, and Barth was forced to interrupt. "Look, John, the boss keeps hounding me on how he wants something on that resurrection business sort of a religious theme-song for the new order. You liked the old guy a lot, didn't you, John?" "Yes," said Fahey, "always I have loved Death as dearly as life itself." he seemed suddenly serene, even profound, although still quite insane. "Yes John, I know how you feel. Now why don't you put it all into music?" And as he spoke he passed his dagger through the bars. Slowly Fahey turned and got his guitar. he sat down, tuned the guitar into an open G, leaving out the third, and gently caressed the dagger to the strings. As the dagger sled up and down the fretboard the room was suddenly filled with warmth, a radiance which permeated to the very depths of the young man's being. It spoke of suffering and of love, and of the humility and strength of the downtrodden Volk of Takoma Park. It bore witness to 300 years of tragedy and torment, and yet above all it was a hymn of affirmation, a poem of praise stemming from that which is most human in all of us. And when, towards the end, he quickened the tempo, the room came alive to the driving, surging, forceful, and pounding rhythm, and to the acidulous, corrosive, smoldering and rough-hewn tonal quality of the music. Evil Devil Woman started stripping and dancing around her cage, making strange gestures at She-Wolf. When it ended the insipid young man was flushed with ecstasy. John Fahey---alive and playing! Soon he would announce his rediscovery, and he would bring him to Newport, write his thesis, and become a powerful force at Nettles. It was too good to be true! Fahey reverently placed his guitar on the floor, and wandered toward the rear of his cage. "heh, John, what will we call that one?" called out Barth, who appeared to be bored. But Fahey had not really heard the disorganized Jew, he was again gazing lovingly at the mat of woven grist, and presently addressed it in solemn tones: "I am the resurrection and the life, and mats that believeth in me shall fear neither hoof of jabberwock nor claw of Getchell, for I am with thee, thy pleats of woven grist, they comfort me, particularly my back, for it's been aching quite a bit lately. Arthritis, I guess---." "Hold on Fahey, that's a little bit unwieldy for a song title. Can't you make one a little shorter?" At this moment Fahey's confusion was genuine. There was nothing he could say. He said nothing. "Must you always be so difficult?" complained Barth, who seemed mildly put out. "Oh well, I'll just cut the one you gave me down to "I AM The RESURRECTION," and leave it at that. Ed did want a religious title, and that's what he'll get. But---a religious theme song for the new order? Impossible! John Fahey simply can't deliver a piece of that raw power, of that captivating dynamism that moves men and nations. Now if the Boss would only let me do one for him, then he would----"
"What is this all about the new order?" burst in the feeble young student. Barth's use of the phrase had triggered him into speaking, for he had found Denson's frequent references to the "New Order" quite puzzling. "Let's see," said the traitorous Jewish manservant craftily, "What has the Boss told you?" "he said that Fahey was to be the aesthetic standard, and Death the religious standard. 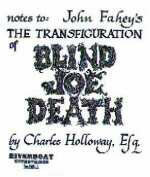 In fact he dated the new order from Feb. 5, 1962, the date of the purported bodily ascension of Blind Joe Death. Also, he described in some detail the Intergalactic Fahey Supply. Now, what he said nothing about was the political standard." "Ed told me to tell you everything, and I shall do just that. The new order is to be an Intergalactic Benevolent Suzerainty under the Boss." Once again, Barth began to speak heatedly, with fanaticism smoldering in his eyes, and an evil smirk on his lips. "The takeover will come as follows: Soon, very soon Denson will address to the world an ultimatum. Any section of the world (and for that matter the inhabited universe) which does not accept his loving embrace will receive no afterbirth. The hungry Getchell will decimate the population, for they will eat nothing save afterbirth and people. But the people won't kill the Getchell, for Ed's hypno-techniques in mass-communication have over the last 50 years instilled in the common man a love of Getchell far greater than that for his fellow man, or even his own family. Thus hegemony is guaranteed. The Getchell, in effect, shall be the military of the new order, but a military loved by the subject peoples more than even their sons and daughters. This plan cannot fail! It must not fail! IT WILL NOT FAIL!" Barth paused, suddenly calm, and smiled sagely. "You see, son, to come up in this world you need a proper understanding of power, and its legitimate use toward profitable ends!" He drifted into thought, and then spoke softly, reverently. "Ed told me that once, long ago. Such a great man---a great man." The insipid young man was awed by all this, but one topic still remained unexplained. "What about this resurrection of Blind Joe Death?" "The Boss feels the new order needs a state sanctioned (i.e. : Denson sanctioned) religion to keep the masses guilty, docile, and subservient. You know---opiate of the people and all that. Thus---the cult of DEATH!" "And what about the Resurrection itself?" "Oh come now, son, you know better than that. I dug up the body shortly after burial and fed it to a Getchell. Then I had Ed tell Dusty about Death's "Resurrection," and the poor, dumb oriental swallowed the whole thing. You see, Dusty symbolizes mass man, ignorant and superstitious. I understand these people. All in all a clever little ruse, a master stroke. I thought of it myself. But now it is getting late and we must retire. "But I must leave, quickly!" "No, that's not actually the case. Not at all!" As the weeks rolled on and on the youth had plenty of time to ponder his predicament. He had found John Fahey, and, perhaps of more significance, he had come upon a conspiracy to subjugate the inhabited universe. Had he escaped with the news he would have been a hero, revered in history books around the world for centuries to come. But now---he was to spend his life in a cage, under the care of a madman. He kicked himself now for his foolishness. Even when all of Ralph Riverboat's "demented ravings" were being revealed as stark, chilling fact, he had not paid heed to the old man's advice. He remembered, now, how Riverboat had cried out "Beware, beware of Denson and his Getchell, who may yet conquer the world. "And why, oh why, hadn't he realized that Denson's ruthlessness had from the start imperiled his well-being, even his life?" There was no hope now, and as the days passed on and the insipid young man's mind gradually fell into full deterioration, he began to entertain the one hope--the same hope entertained by another madman, Fahey, that perhaps someday the female Getchell, Linda would have a change of heart and come and rescue them. And although he had learned a little in hindsight, he was in his thinking primarily and somewhat unclear as to certain particulars. Thus he was terribly confused. For, you see, the insipid young man was also very, very stupid.